So what does it smell like? It was the smell of the plants by the sea, with possible marine notes. Housed in the Carre flacon and others. "The best colognes for winter: Eau de Chypre, Eau de Judée, Benzoin extract. 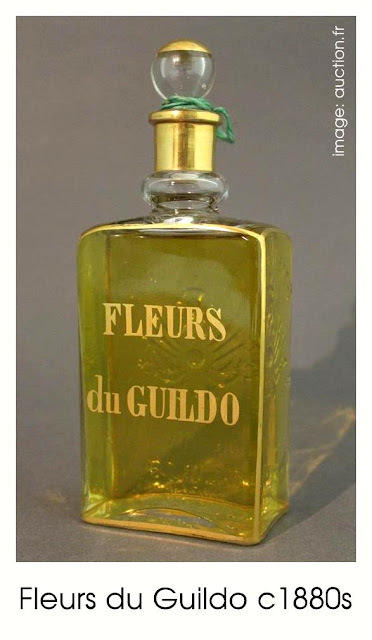 As fashionable perfumes: Primavera de Espagne, Impérial Russe, l'Opéra bouquet, the new fragrance Guildo has a great success, its flavor is exquisite, sweet, it is fresh and persistent." "Flowers or plants they are wonderfully true. One thing is missing from the first perfume. But how easy to make the ghost quite real. Our perfumer, Guerlain is not there to fly to the most subtle calices their exquisite soul whose aroma in a drop of perfume gives life to what was just now simulacrum. Essence of violet, roses or geranium, flowers of broom, picked on the Breton moor of Guildo , heliotrope or lily of the valley: a few drops sprayed and here is the bouquet that comes alive, awakens and sing! The embalmed symphony spreads, mingled with the passing air having its seat in the flowered boot that blossoms above the flamboyant glass of Venice. Who could believe that these are artificial flowers." "Les deux autres produits sont des extraits pour le mouchoir aux odeurs Jicky et Guildo. Le Jicky est un parfum des tropiques très suave et original qui n'a pas d'analogue. Les personnes qui l'ont essayé en sont enthousiastes et le redemandent ce sont des prémices de succès. Le Guildo est agréable et persistant il produit une impression vive et excitante comme le parfum des plantes du bord de la mer. Il plaît aux personnes qui aiment les odeurs accentuées. Otros dos perfumes discretos y distinguidos, dedicados á las señoritas: la Primavera, de España, y Verbena, fina y de una frescura delicada.